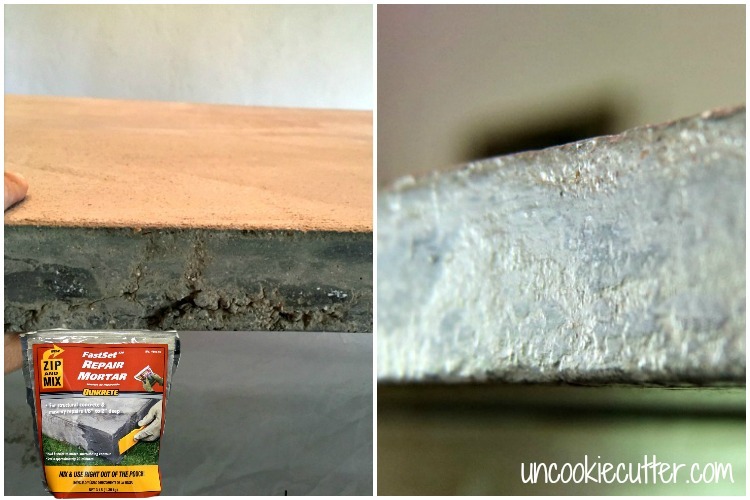 A Concrete Table is a beautiful way to bring an industrial vibe to your room and is totally doable with this DIY tutorial. I’m so excited to share my newest concrete table with you guys, this one is such a beauty! I made this table for some friends and did a few things differently than I did with my table. If it didn’t weight about 800 pounds, I would probably run over to their house and try and steal it. 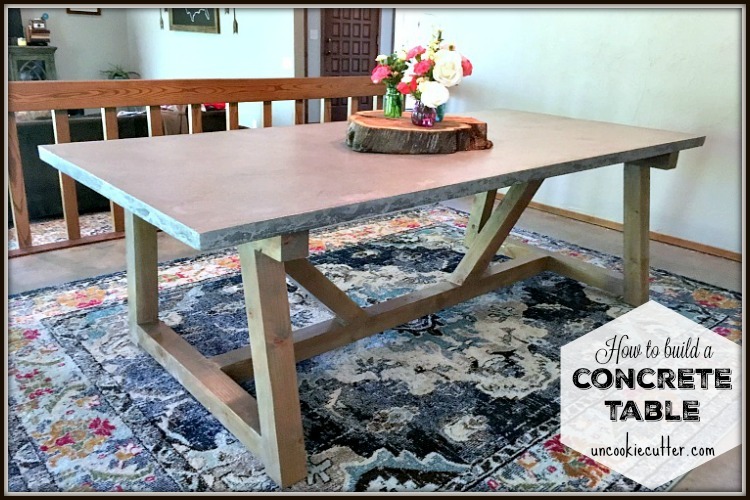 I’ll take you through what I did and how you can make your very own concrete table for a fraction of what you would pay for one from a high-end store (ahem, I’m not naming names here…). Just to clear things up, I’m not one to make furniture for others. Many bloggers do, and that’s awesome, but it quite frankly stresses me out. 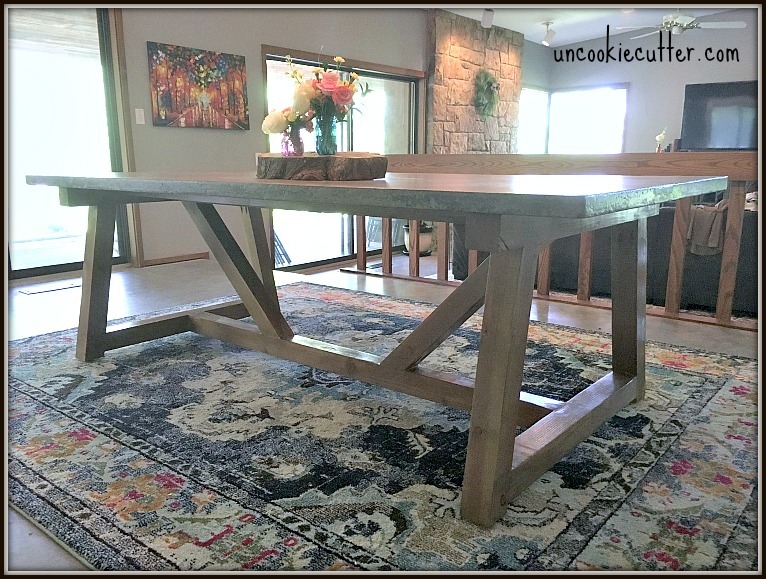 I always worry they might hate it, it might fall apart, a million other reasons…but, our friends Mitch and Melanie really wanted a concrete table, so I finally agreed and I’m so glad I did. Melanie was one of the first people I met when we moved here a little over two years ago. Her daughter and mine were fast friends. For those that don’t know, our daughter is living with autism and has a hard time meeting and conversing with kids her age. We were so nervous about moving to this tiny town in the middle of the country and we weren’t sure how it was going to go for our girl. But in came Melanie’s daughter. To the point, frank and she didn’t mince words – just the type of friend our girl likes and needs. The first time I ever picked her up for a playdate, I noticed her house was for sale. I asked her where she was moving, to which she replied, “I don’t know…some stupid wood house”. I had to laugh a little because as you may know, we live in our very own stupid wood house. 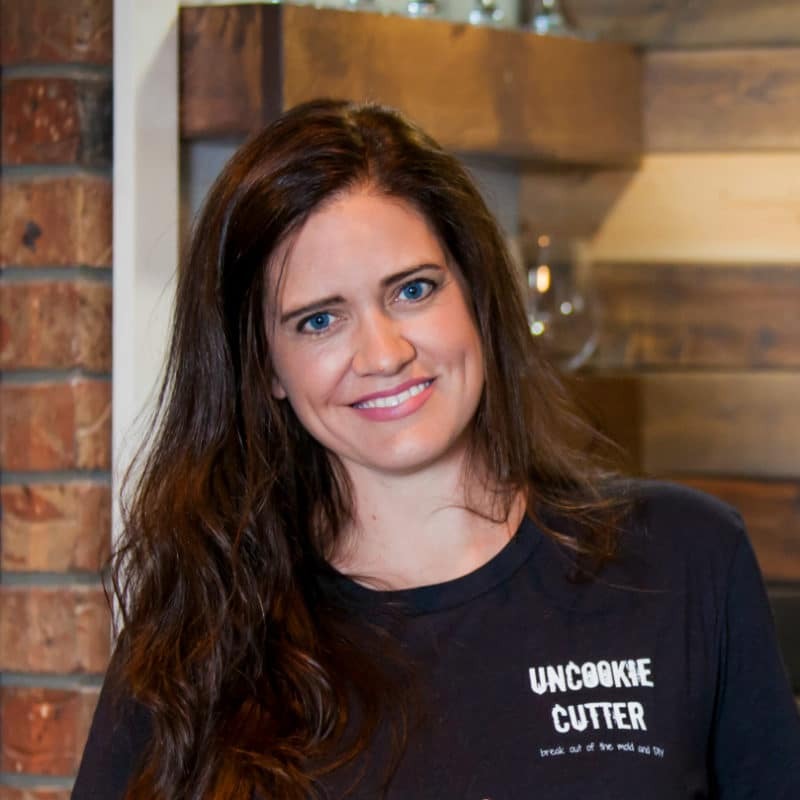 When I first saw their new house a few months later, I had to laugh again because it looked very similar to ours – like I wouldn’t be surprised if it were the same builder similar. 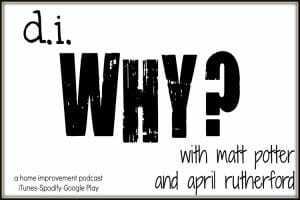 We have since become friends with Mitch and Melanie and we have the ongoing “stupid wood house” joke to commiserate on our fixer-upper experiences. I happen to LOVE Mitch and Melanie’s house. They will tell you though, that their daughter would move into a “cookie cutter” house in a heartbeat. She does not have time for this “fixing up the house” nonsense y’all. Anyway, their house is funky and woodsy and cool as all get out. One of the main reasons I agreed to do this table is because I knew it would fit perfectly in their space. And, for once, I wasn’t wrong. Look how perfect it fits in with their rustic/industrial vibe. Now, down to the nitty gritty. 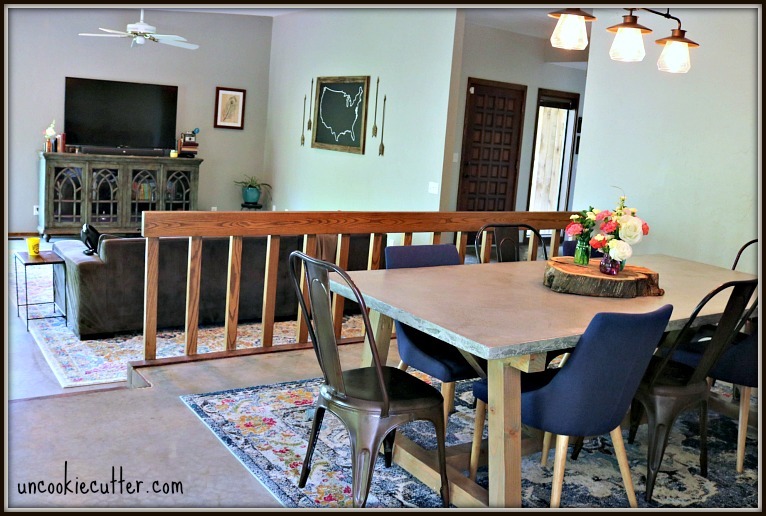 In the interest of not having the longest post in history, I’m going to refer you to my first concrete table post – here, as well as to DIY Pete and THIS post, which was what inspired me to start working with concrete. 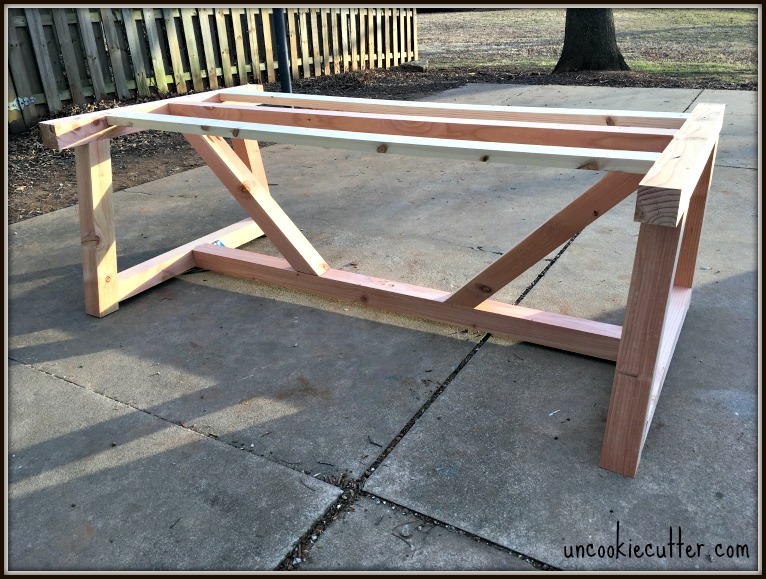 Please read through this post, then head over to those two posts to make sure you are fully prepared to build your own table. Let’s start with the base. Melanie sent me a picture of one of Restoration Hardware tables she loved, and I loved it too. I started working on plans and then decided to make sure there were no plans already out there. Of course, Ana White had some beautiful plans already drawn up for this exact base, so that made things a lot easier. I love her. Anyway, Melanie wanted to make her table a little bigger than mine, which was a great idea. Their top is 94″ x 44″, so I adjusted the size of the base to accommodate that. This base is 78.5″ x 42″, which fits 8 with plenty of room. This post contains affiliate links. Quikrete provided the concrete for this post. Please see my full disclosure policy HERE. The only thing I did differently besides making the base a bit bigger was that I sent my boards through the planer first to cut down sanding time later. I LOVE my planer. This was my very first project with it and it’s my new favorite tool. I also added furniture feet because I never like to put wood directly on the floor. I put these same ones on my table and they’ve done a great job holding it up. Then it’s just two coats of Minwax weathered oak on the base as well as two coats of polyurethane to protect it. We used clear satin to make it look more industrial and less glossy. Now, for the good stuff. I built the form to the size they want. 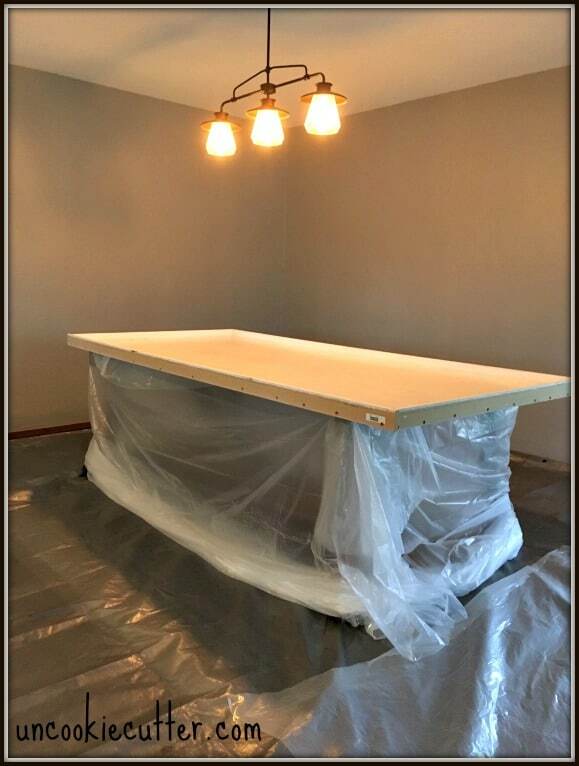 You may remember from our first table, that the hardest part of the whole project was moving the slab from the garage to the dining room. It was quite the ordeal, so this time Melanie had the great idea that we just build the table right on top of the base in the dining room. Genius. This worked so much better and was so much easier. I set everything up and we got ready to build. 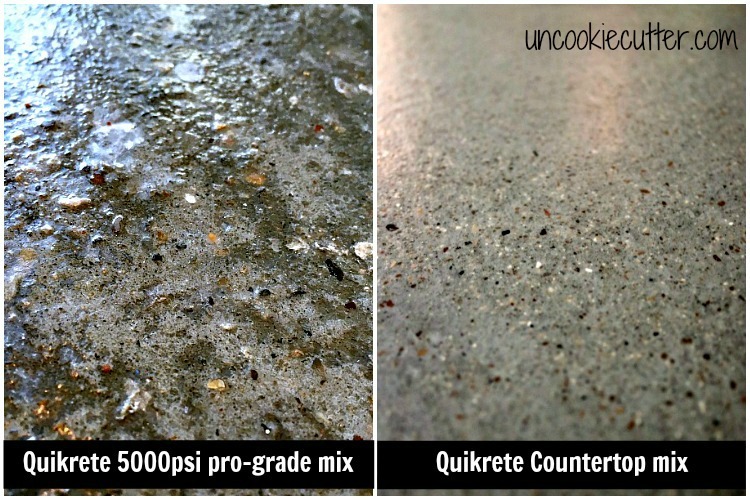 This time around Quikrete was kind enough to provide us with some table and countertop mix to try out. Now that I’m all done, I will tell you this is a much better mix to use for a concrete table or countertop. I’ll get into that more in a minute. But, for now, here is a quick time-lapsed video of Melanie and I mixing up the concrete and pouring it in. We followed the directions on the bag, but added a little color to make sure it came out gray and not tan. Make sure to mix the color with water BEFORE adding the concrete. As you can see, we used a huge plastic bin to mix it in, one bag at a time. Once again, I’ll direct you to DIY Pete. Please go see all his tips. Don’t forget to add your rebar and mesh! Another reason it worked a lot better to build right on the base was that we could get underneath easier so that we could vibrate and hammer out of the bubbles. Spend some time on this part! Tap, tap, tap away. One note, I don’t have a pic, but the middle started to bow down a little so I added some 4x4s as supports until it dried and cured. Once the concrete had dried and set, I waited about two weeks, we pulled off the form. Since we didn’t have to move it as far, it was way easier. It was super solid, but we did have a few issues on the sides. No worries, I used this Quikrete FastSet Repair Mortar Mix to fill the holes. It was so easy – just mix it right in the bag and then put it on with the provided plastic trowel. The color is a little off, but I think it makes it look more like natural stone. I wrote a whole post about it that you can find HERE. To sand, I used this wet/dry sandpaper. I love this concrete mix, because it was so much easier to sand. With regular concrete, you get a ton of huge rocks that can interfere with your sanding and even cause huge chunks to break off. No problem if you aren’t using it for a countertop or table, but for those spaces you want it to be extra smooth. When I did my bathroom countertop, I sifted out the large rock and it took FOREVER. With this mix, Quikrete has done that for you. It’s smooth and sleek but still has that beautiful stone look. Just so you can see the difference, I took a picture of my table. Still so very cool, but cleaning is just a bit more work when you have all those little dents and unevenness. After sanding, I had Mitch apply concrete sealer – about 3 coats over the weekend. Then 3 coats of Polyurethane and it was done. So, this is not the easiest DIY but it’s honestly not so bad. It’s totally worth it too, we LOVE our table and I’m confident Mitch and Melanie are going to love theirs. I love the funky mis-matched chairs Melanie picked out. Find them HERE. Okay, that’s about it. Whew! Even while trying to make this post shorter, it’s still crazy long. Ask away if you have any questions about this or my other concrete table and let me know if I left anything out :). Be sure to check out my first post for more tips and HERE for the lowdown on concrete. Thanks so much Pete, and thanks for the awesome tutorial so I could get this done! April, I’m blown away by this. Seriously blown away! Beautiful! It turned out beautifully! Such a great statement piece! April, this is amazing! You always blow me away with your furniture construction & concrete skills! Thank you Emily! I love concrete :). I love this! Can I ask where the rug is from?? My friend got it at Overstock. I love it too, absolutely gorgeous! Hello April. I just discovered your blog through Thrifty Decor Chick. What a talent you are!! I’ve so enjoyed looking at your projects/blog. 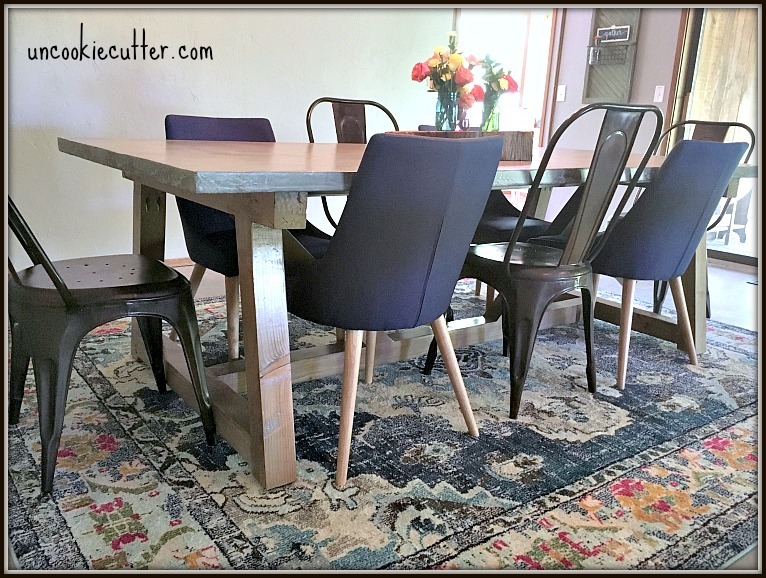 I especially love the concrete table you made for your friend (that was featured on Thrifty Decor Chick). I would love something unique like that for our outdoor patio! You’ve helped my creative juices to flow now on how to create something like it!! But, today, I was wondering if, by chance your friend remembers the name(s) of her beautiful dining room & living room rugs in her home? They both are beautiful and look like they coordinate well together. I’ve been searching for almost two years for our dining & living room & have not found the right ones….until today, that is, if you maybe could help!? I saw another asked & you said she purchased them through Overstock & in an attempt not to bother you w/asking, I searched & searched & could not come up w/the right rug. I thought if maybe she remembered the names of them, that might help my search. If you have a brief moment & could respond w/any info she might remember when ordering them, gosh, I’d so appreciate your help! I’m off to research more of your blog & to share it w/my husband. Maybe by the end of the summer, we could recreate one of your unique masterpieces for ourselves/patio!! April, you just made my day!! Thank you SO much for the super quick reply & your friend’s info. on the rugs. I so appreciate it!! And yes, my husband & I saw the outdoor concrete table. We need to look more @ your tutorial, but I think we will tackle something like it. We like that it is “uncookiecutter” ; ) rather than going to Target & buying what everyone else has!! So, you might be hearing from me again if we have questions as we attempt our skills @ one of your masterpieces! Thank you again for your time & effort in providing me w/the rug info. Have a great day! No problem, I’m so happy you are going to try it. Can’t wait to hear how it turns out! This table is *perfect*!! Job well done! 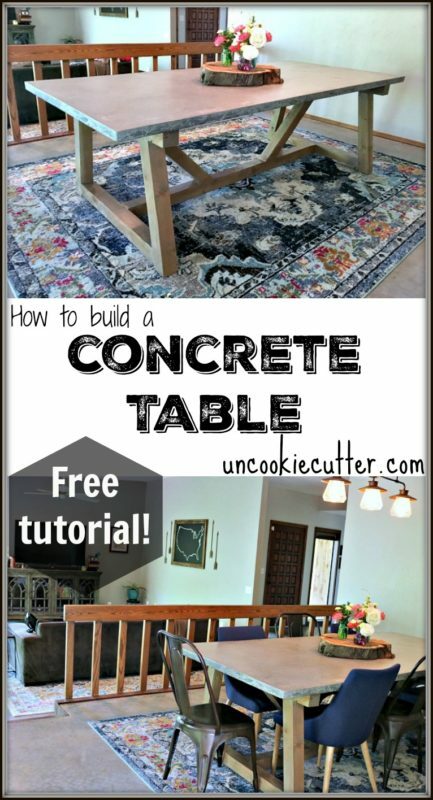 I have never heard of a concrete table and searched through your blog to find it. It’s my first time here. That is so unique and you did a great job. I was thinking it was going to be solid concrete and wondered how this was going to turn out if not fall through the floor. Is the bottom of the table still just wood or is it painted ? I didn’t know they made a concrete for things like this either. I’ve learned so much. I’m going to bookmark this website and keep looking around. Thanks Vampy, glad you found me! You have made awesome. This is a great post. 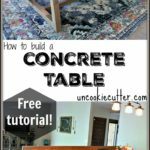 I was searching some tips for the concrete table to create. The essential advice for me. Your creative mind is beautiful. Thanks for sharing the post. This is a cool idea! Very useful with modern appeal and love how the project turned out! The base thickness caught my eye, but I wonder what it looks like a couple years after the build? Would be cool to see how its held up. We’ve had ours for about 2 1/2 years and it’s holding up great so far! Hi April, I recently purchased a concrete table and am looking for chairs like the ones you have in your photo. We like Navy blue too with wood legs, where did you find the ones you have in the photo? Those aren’t mine, but I believe she got them at Wayfair or Overstock. It’s been a couple of years now, but I did see some similar ones on Wayfairs site, if you just search dining chairs by color. Good luck!